interesting items. Yes it is more than just a wonderful bakery with the best sour dough around. Mary and her team of nine people including family are dedicated to making their community happy. Their products are all made daily with lots of love. The bakery items and birthday cakes are yummy and great value. Customers come from far away to taste their bread and cakes. It is hard to decide which delectable item to choose from. 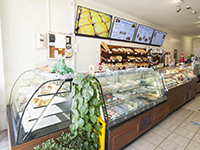 Go to the website www.ausvibakery.com.au to discover some of the many other things they can offer you.